The iPad mini comes in a box that's proportionately smaller than the iPad 4's package. Besides the tablet itself, there's only a Lightning cable and a small charger. It's the iPhone type of charger, not the one the big iPad gets. 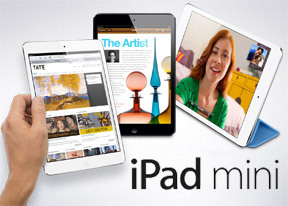 The iPad mini faithfully follows the design language of the previous iPads and the iPhone. There are subtle differences but if you've used an Apple product, you should feel right at home with the mini. Unlike the new iPhone, which uses two distinct kinds of finish on the back, the iPad mini's rear is all aluminum - and the sides too. The 7.9" screen bezel is thinner on the sides than top and bottom, unlike the big iPads and similar to the iPhone. Just like the iPhone, the iPad mini's software detects and ignores false touches from the sides of the screen, so resting your thumbs shouldn't be a problem - the mini is meant to be held with your palm on its back anyway, not by the side bezel like you would its bigger sibling. Anyway, above the screen is the 1.2MP FaceTime camera, which is right in the middle. Below the screen (also in the middle) is the familiar home button. Except it's the tiniest home button so far, smaller than that of the big iPad and the iPhone. It's still easy to press, though we can't vouch for its durability - home buttons on iGadgets are probably the quickest wearing bit. Of course how quick depends on your usage but, over time you may start experiencing missed clicks. Unfortunately, the only way to tell if Apple has fixed the problem is to wait and see. The position of the hardware controls on the sides of the mini tablet is identical to that of the big iPad. The Power/Lock key is at the top, on the right, and there's a hardware mute switch and volume buttons on the right side of the tablet. The switch can be set to either act as a Ringer/Silent switch or as a Screen rotation lock. Also on top is the 3.5mm audio jack. Apple has kept the positioning of the jack and haven't moved it to the bottom like they did with the iPhone 5. At the bottom, there's the new Lightning connector and two grills for the stereo loudspeakers (yep, there's a speaker under each grill, unlike the iPhone 5 where one of the grills is for the microphone). What makes the Lightning cable unique is bilateral symmetry. There's no 'up' and 'down' like with regular USB cables, you can plug it either way. The port carries out charging and data transfer duties and - with the appropriate adapter - can do TV out and read photos off USB storage (but no other files). The back and sides of the iPad mini are a single slab of aluminum, which is pretty cool. You get a choice of two colors - Black/Slate and White/Silver - but be warned, the back is a fingerprint magnet and it's especially visible on the black model. So, you'll have to clean it often, but the feel of aluminum is great to the touch. The camera is in the top left corner at the back. It's quite close to the edge, but there's no danger of putting your finger on the lens regardless of how you hold the tablet. Speaking of colors, the color of the bezel on the front matches the color on the back, unlike the previous Apple tablets, where the back was always gray regardless of the color of the front panel.